The finale of Miss Universe 2018 is just two weeks away and the delegates competing for the crown are more than prepared to showcase their talents. While the preliminary round will be starting very soon, the delegates are currently blowing off some steam looking like goddesses in fashion events and photo shoots. Recently the Miss Universe organization held their Thai Fashion Night honouring the regional fashion and attempt at the cultural preservation of Thai fabrics. The organization amalgamated Thai silk fabrics to create gowns that looked heavenly and elevated the beauty of the delegates’ manifolds. Their event also saw the organization host a dinner as well as conduct an auction show. Andrea was seen wearing a dreamy off-shoulder gown which was navy blue with yellow stripes in the middle. Her hair was neatly done in a tight bun paired with red earrings. Andrea took to her Instagram account and expressed her joy about the beauty of the gown that she was wearing. She said that she felt like a princess and that it was a night that she would never forget. Well, Angelopedia thinks that she looked like a queen, poised, elegant and a complete Miss Universe material. H'Hen Niê was seen wearing a maroon gown with a thigh-high slit and a bow on the back. Her cropped hair showed off her beautiful necklace paired with matching earrings. She took to her Instagram account to thank the people who were behind the creation of this beauty that she was wearing. H'Hen looks ravishing in her gown and was able to carry it with ease, which is why she is one of Angelopedia’s favourite in the Thai Fashion Night. Valeria was earring a light pink strapless gown, with a high slit in the middle. Her waistline had floral origami sewn in which made the gown look even better. Her hair was styled in loose curls during the fashion show, making her look like a supermodel who knows all her angles. Added to that, her runway walk was the cherry on the cake as she showed the audience how it’s done perfectly, which is why she is one of Angelopedia’s favourites in the fashion night. Valeria took to her Instagram and said that it was a wonderful night. Catriona looked like royalty in her purple gown with a deep neck plunge line. She was carrying the gown with such confidence that she looked like the crowned winner already. Catriona’s walk was poised and perfect, embellished by the beautiful trail of her gown. She wore her hair down with soft wavy curls, minimal makeup and beautiful earrings. Catriona was a sight to behold throughout the night. She is one of Angelopedia’s favourite delegates for the fashion night due because she looked nothing less than perfect, smiling at the camera and walking like a queen. Sthefany was wearing a halter neck red gown that made her look taller, sophisticated during the fashion night. The upper portion of her gown has detailed beadwork that made them look even more attractive. In her informal photos wearing the gown, she looks like someone out of a movie poster. Sthefany is one of Angelopedia’s favourites because she looks amazing and fit in the pictures, all ready to dazzle the audience. Sonia looked like a vision in her one-shoulder orange coloured gown with a thigh-high slit. Complimenting her gown, she was wearing a jewelled hair accessory, with her hair neatly done in a braid. Her minimal make-up look elevated her beauty even more. Sonia became one of Angelopedia’s favourite for the Fashion Night because she was oozing out confidence all throughout. Virginia was looking like an angel in her moss green gown during the fashion night. Complimenting her gown was a white trail that flowed behind her as she walked. Her hair was neatly done in a tight bun which showed off the beautiful earrings that she wore. Virginia strutted gracefully on the stage as all eyes were on her. She is Angelopedia’s one of the favourite delegates in the Thai Fashion Night as she stood out of the crown due to her beauty, grace and confidence. Nehal was wearing an orange off-shoulder gown with fur sewn in, at the top. She walks was very fierce, but also very graceful. Complimenting Nehal’s gown was a beautiful long white trail. Her hair was tightly done into a bun and she has minimal accessories. Nehal is one of Angelopedia’s favourite delegates who stood out of the crowd. She is also one of the strongest delegates competing for the crown. Manita was wearing a light blue strapless gown with golden sequin work. The gown flowed to the ground, which made her look like a queen. Her hair was tied in a bun on the nape of her neck, and she looks like class and style during the fashion show. Manita took to her Instagram account to express her feelings about the night, and it seems like she was quite smitten by it. She ended her post praying that the friendship between Thailand and Nepal intensifies in the future. Yuumi can be seen wearing a light pink body-hugging gown which complimented her figure perfectly. She looked like a beauty queen during the fashion night pairing her gown off with funky earrings and keeping her hair neatly done in a bun. Her smile was the most beautiful accessory that she was wearing and there is no doubt that she will dazzle during the coronation night as well. 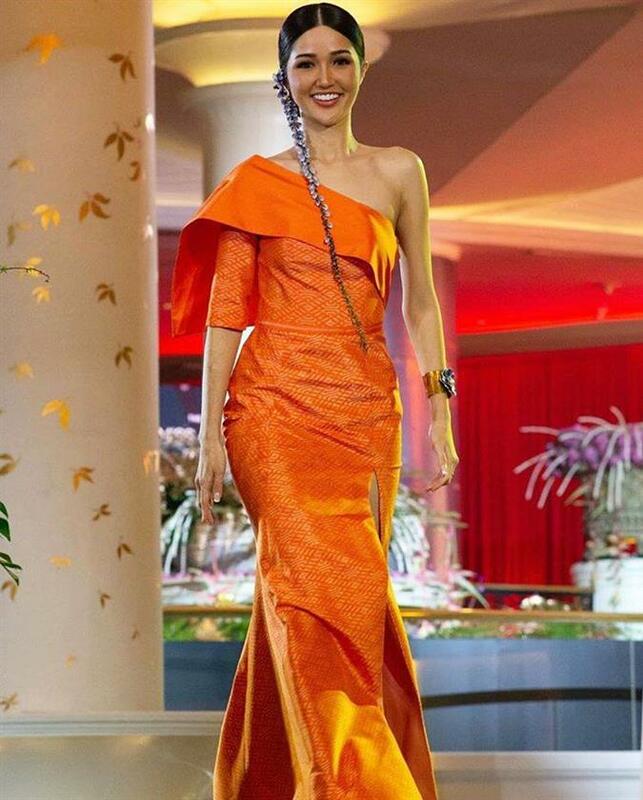 Yuumi is one of Angelopedia’s favourites for the Thai Fashion Night because she stood out from the rest of the crown. The grand finale of Miss Universe 2018 will be held on 17th December 2018 in Bangkok, Thailand where more than 90 delegates from all over the world will be competing for the crown. The conclusion of the event will see the outgoing Miss Universe 2017 Demi-Leigh Nel-Peters crown her successor and sign off as an international beauty queen.